Drayton Press, long a stalwart of the West Drayton (Wikipedia) area has finally given in to outside pressures to buy up the land in the area for further redevelopment. It is always sad when things change, sometimes it may work out for the better, but change is hard. Drayton Press was one of those places that always stands out when you drive past. The slightly shabby building that seems entirely out of place in the area – The row of shops are all single-story, bungalow style buildings. Behind them is the canal and they are built pretty close to it. On the opposite side of the road, there were new flats built that overlook the canal, the close proximity to West Drayton station makes them more favorable to commuters going into Central London. 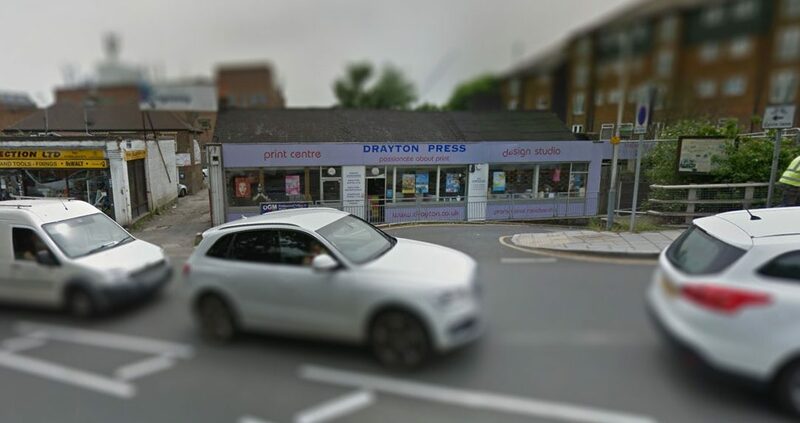 Drayton Press was one of the biggest printers in the area and they were usually the first place I sent people looking for T-shirt printing or emblazoned mugs. I guess I noticed them because I was into printing myself. A few years later (and a few years ago now), one of my closest friends worked for them, it put them back on the map for me. He’d often talk about how it was working there and what new things they had started to print, which printing process he had learned this week etc. It was interesting, it was the first time he had worked in a similar area as me and we enjoyed talking about the similarities and differences. They also had a location in Uxbridge town centre, I had used them a few time to print t-shirts. This was the first location that my friend worked at before the location was sold or sub-let and they amalgamated all their business locations to the West Drayton location. the location was where most of the printing took place, with the Uxbridge location being mainly customer facing. When it closed, my friend moved to the West Drayton shop and started learning more about the print process. Talking to my friend I found out that they had moved to Reading after the Pro Logis development wanted to buy up the land on the canal-side. They had apparently been turning down offers for a while but must have been made a decent offer that allowed them to move and get a nice new location.